One of the most attractive adventure activities for travelers to the Valdes Peninsula is Scuba Diving. Scuba is a discipline that is enjoyed by more and more visitors every day and there are many ideal underwater formations in and around the coast of Puerto Madryn and Puerto Piramides. 15 different professional dive companies in the area offer from the very first baptism dive to certified courses, deep dives, and wreck dives, amongst many other diverse options. 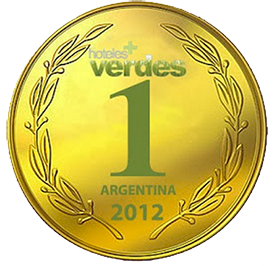 The Valdes Peninsula is recognized as the Scuba Diving capital in Argentina. Immersions can be made using tanks with compressed air, for certified divers, or with the use of a snorkel for beginners. 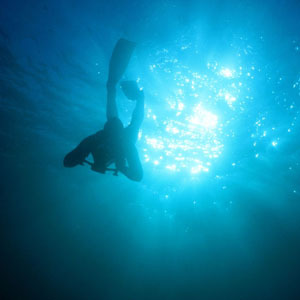 Free diving has become more and more popular in the area and is a technique that requires physical training together with a dedication to individual mental relaxation and special attention to a proper diet and hydration for best results. The healthy aspects of free diving are made even more attractive by the weightlessness and liberty of movement that is discovered without the use of tanks and dive gear. 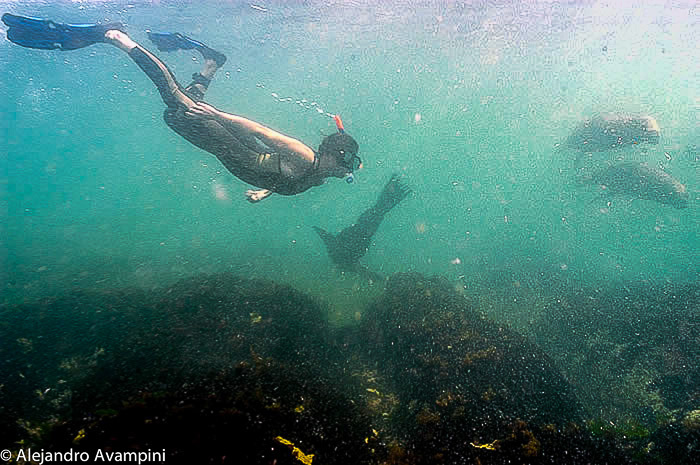 Without a doubt, the newest alternative amongst all of the dive options is snorkeling with Sea Lions. Since the approval of this activity by the provincial government of Chubut, it has become very popular and really is a must do experience, at least once in your life. 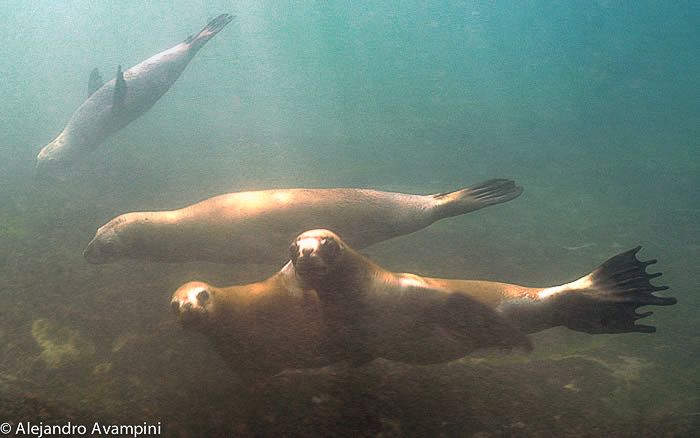 Floating on the sea in a dive boat close to a Sea Lion colony activates the curious nature of these marine mammals and while the divers prepare to venture into the water the boat becomes surrounding by these excessively inquisitive creatures. 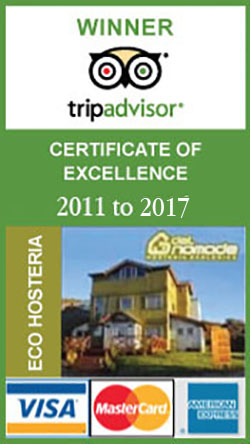 Once over the side, one is immersed in the closest contact possible with wildlife of the Valdes Peninsula and underwater. To make this excursion it is not necessary to be a certified diver and due to the use of a neoprene suit, providing positive buoyancy and maintaining body heat, it is not a requirement knowing how to swim. Calmly breathing while floating on the surface in a wetsuit with nothing more than a mask, snorkel and fins and surrounded by these curious and friendly ocean-dwelling mammals is an unforgettable experience. All of the adventure activities offered in the Valdes Peninsula are safe, yet the unique nature and close interaction they allow creates intense, unimaginable and unforgettable sensations. This activity has generated a lot of work in the area for professional divers and guides accompanying visitors in their interaction with these beautiful and innocent marine mammals, an investment well worth the rewards. On land sea lions are territorial, often remaining in the same place for hours and made uncomfortable by the close proximity of man, yet in the water, their behavior changes dramatically. Underwater their movements are rapid and controlled, almost as if dancing below the surface as they approach, surround and dive below the observer. 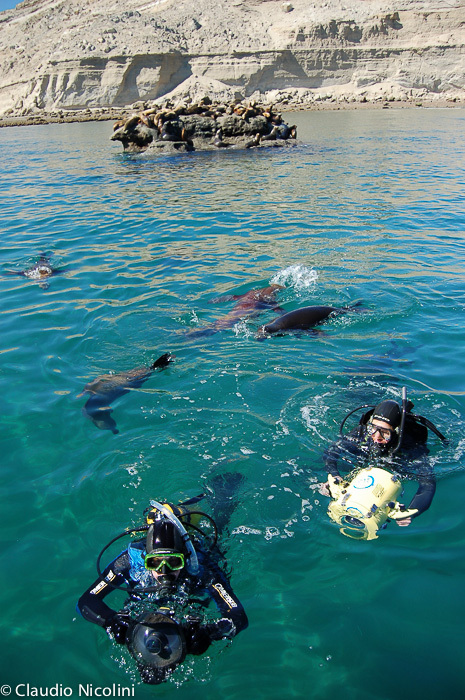 Swimming diving and snorkeling with sea lions are one of the activities that I most recommend in the area. They are mammals, but marine mammals whose curiosity often dictates their behavior. This is readily observed when approached in a boat as they immediately come in close, raising their heads and careening their necks while constantly changing from one side to the other, as if looking for the best perspective for observing us. Dozens of animals, mostly females, juveniles and newborn calves from the previous summer, surround the boat and raise their heads high as if investigating the interior of the vessel. For the most part, the dominant male, easily recognized by his size and thick mane, remains at a distance controlling his harem. 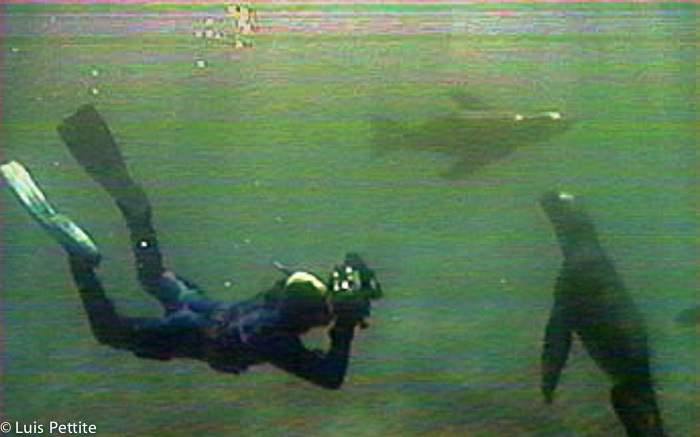 As each diver enters the water the Sea lions curiously approach and begin to play around the divers like they were one of their own. For those with experience in underwater photography, this is the ideal adventure for capturing amazing images of wild nature in their liquid universe. The density of this aquatic environment surrounds everything equally and allows for silent contemplation from a completely different perspective. With looks that say a thousand words, an almost telepathic communication is established with the sea lions. 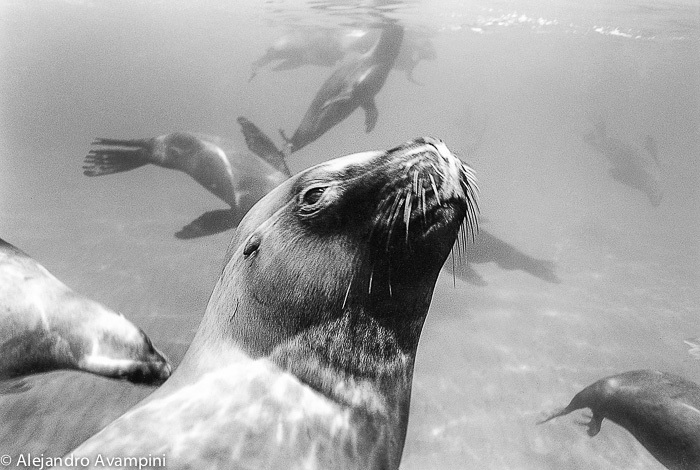 In my work as a wildlife photographer, my desire is to transmit, through the images I take of animals in general and marine mammals in particular, the understanding and symbiosis they share with their environment. Something that we as humans have either lost or have truly never come to understand, consisting in the ability to enjoy the present being free, alert and as one with our surroundings, with innocence, pushed on by nothing more than the vital energy of life itself. The coastal sea lion population was greatly affected as a direct result of the killing of these animals for their skin and fat. 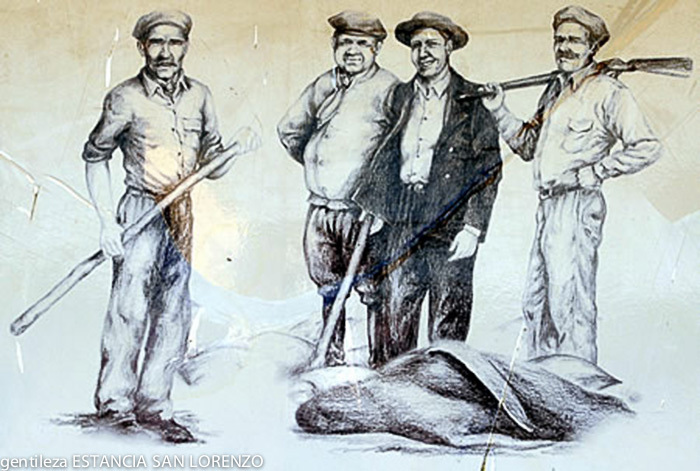 In the Valdes Peninsula alone, more than 260,000 individuals were massacred from 1917 to 1953. During this same time frame, the number of individuals processed is Argentina was well over one half million. Over most of the last century this commercial activity was regulated, and in 1953, the killing of the One Haired Sea Lion was prohibited. 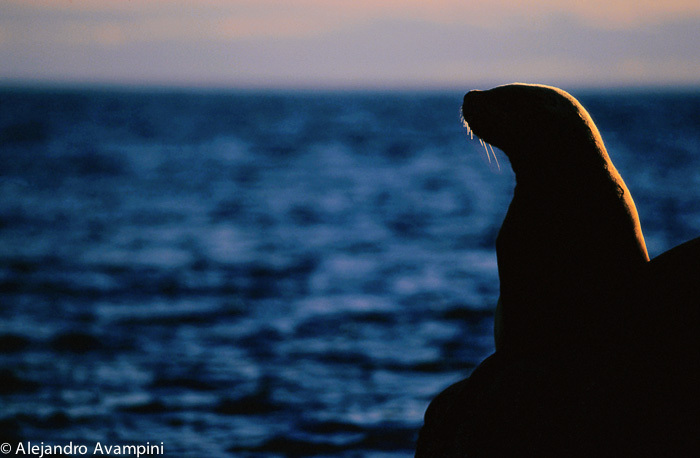 Today, more than sixty years after having suspended hunting, the total population of Sea Lions in the Valdes Peninsula is estimated at 20,000 individuals, less than the number killed per year during the height of the commercial processing of these animals. Those that made a living in the killing of sea lions and seals were known as ¨Sealers¨, and the way their job was carried out was bloody; with long, heavy wooden clubs they would beat the animals over the head and snout until dead. 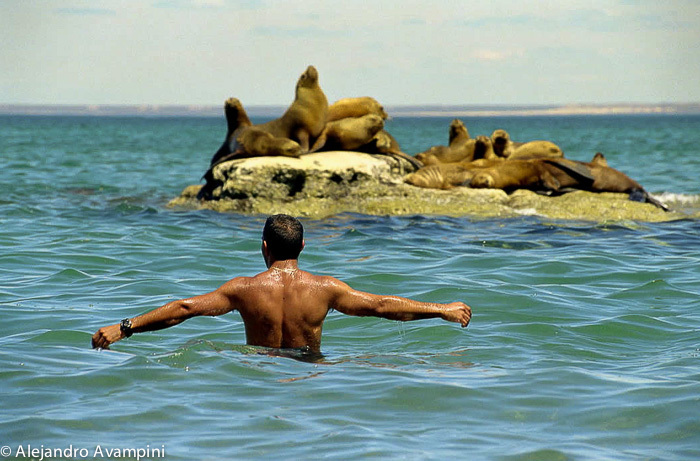 Today, in the Valdes Peninsula, the relationship between Man and Sea Lions is very different. Through the growing concept of conservation and eco-tourism, these animals are now seen in a different light and considered a natural resource. Diving or snorkeling with Sea Lions has brought tourists from around the world to observe and interact with these marine mammals in their natural realm. An intense encounter at close quarters with wildlife in its natural environment is an unforgettable experience. 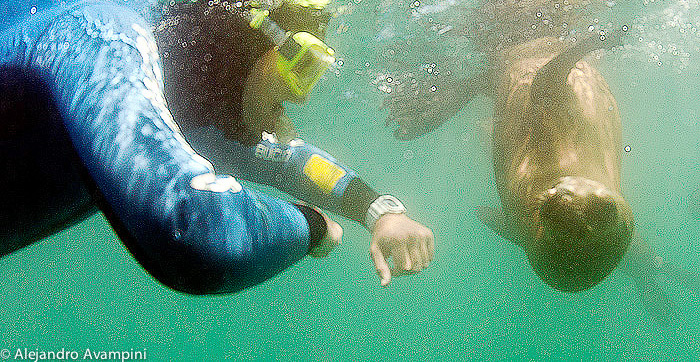 Experienced guides accompany visitors with these curious and friendly marine mammals, creating jobs and offering a unique experience that heightens one’s sensitivity, an investment well worth taking advantage of. On land, Sea Lions are territorial and can remain sitting or be lying in the same spot for hours. In water their behavior changes dramatically, their movements become rapid and with complete control of the space, they want to keep. 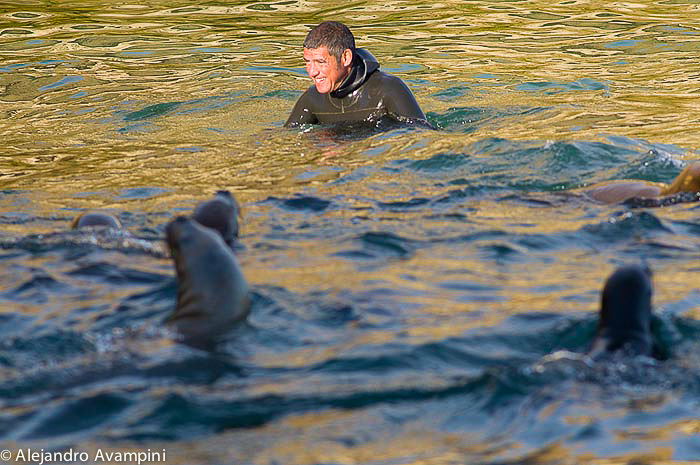 Swimming with these curious and friendly marine mammals is one of the activities that I would most recommend while in the Valdes Peninsula.